According to my teen daughters, multi-tasking does not diminish mental capacity. They insist they can study while texting, listening to music and uploading selfies. Luckily they know not to text or use their phones while they drive, but distracted driving is a reality for too many drivers, teen or not. 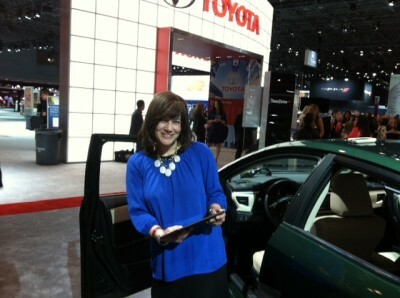 At the recent New York Auto International Show, Toyota had its TeenDrive365 simulator, where the dangers of distracted driving were put to the test, by teens and adults brave enough to face public humiliation. Toyota also offers free courses around the country for parents and teens. And texting was not the only distraction. I crashed on my first challenge, to reach behind me and grab a bottle of water. I was told to reach around with my left hand, but since I was trying to focus on the course I was “driving” (I was wearing special glasses and moving along a screen) I reached with the wrong hand, lost contact with the screen and wiped out. And the other adults I was with didn’t do much better. They crashed while changing the station on the radio, or glance at a text. In fact, I didn’t witness a single person make it through the course unscathed. Ok, and a slight exaggeration. One person did drive safely – that would be my multi-tasking champion of a daughter, who at 21 is not technically a teen. But she’s a New Yorker, and has only had her license for a year. And even though she didn’t crash, she was alarmed at how she kept veering off course. Every new driver should try out the TeenDrive365 simulator – and even seasoned drivers could use the reminder. The Toyota folks also reminded everyone that the hand position many adults learned, 10 and 2 -is not safe. If air bags deploy in a crash, your hands will be slammed back. The safer position for cars with front seat airbags is 9 and 3. Teen drivers might have learned this in their more recent driver’s ed class, but I never hear this before.